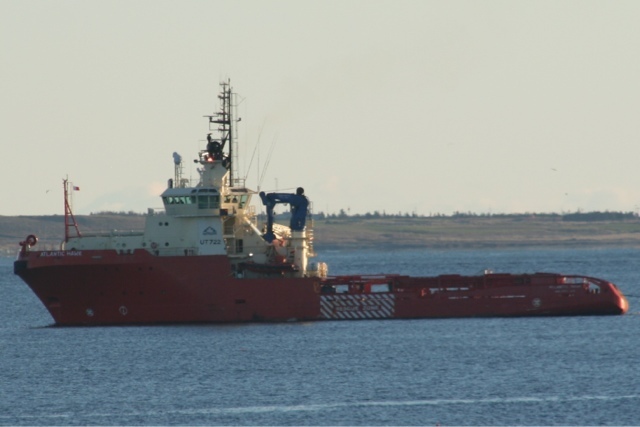 Huskey Energy is reporting that one of its boats has taken the Lyubov Orlova Under tow. Huskey is the Operator of the Hiberina platform off Newfoundland, and contracted Atlantic Towing to provide platform support vessels. As the Lyubov Orlova was adrift without crew, this would count as salvage, meaning Atlantic Towing could file a claim against the vessel to cover its costs for recovery. Given the vessel was sold for scrap, and is likely uninsured, it likely means it is now Atlantic Towings’ to scrap to recover thier costs. As of 4 p.m. today, the towed MV Lyubov Orlova was 100 kilometres north of Husky Energy’s SeaRose floating production, storage and offloading (FPSO) platform, according to a spokeswoman for the operator. An offshore supply vessel, the Atlantic Hawk, began towing the previously adrift vessel at 6:15 p.m. Wednesday. As of 10 a.m. Thursday, it was 70 kilometres north of the FPSO platform. This entry was posted in atlantic towing, Lyubov Orlova, scrap, tugs on January 31, 2013 by Peter Ziobrowski. Husky operates the Searose FPSO (as noted in the Telegram article posted). Atlantic Hawk is on contract to them. ExxonMobil operates the Hibernia platform.